So far we have been discussing techniques that can be implemented by touch screens but augmented reality is something completely new. We did already tell you something about it in our Holodeck Post where we mentioned the interactive kitchen table. AR is nowadays implemented on smartphones. You point your camera at an object, at an environment or something else, and extra elements are added on the screen that relate to the context. One example is taking a picture of the City Hall in Leuven, and getting extra information about it. The phone does this processing based on location (GPS), a digital compass and possibly image recognition. Taking a picture is not something you would have done if you would not have a smartphone and wanted to get some extra information. And also, this system seems to be not as popular as initially intended. Could this be because it demands more effort from us than we would like to do (cfr Can New Technologies Replace Old Ones)? Augemented Reality seems like something great, but care has to be taken where to implement it. With (3D) cameras, the situation becomes quite different. The camera is stationary, and also the visual feedback (a projector) is mostly standing still. A table for example becomes the ideal area where to perform such interaction. A lot of experiments have been done already, and produce promising outcomes. The following videos are all examples of AR with the use of a 3D camera. That’s not really the point of the video. It’s a very basic example of how ‘Everyday objects – and even drawn objects – can interface with computer systems’. This is quite a special case of Augmented reality because reality is not visually augmented (something we got used to because of smart phones) but rather it is functionally augmented. The piece of paper will simply remain a piece of paper (like the city hall will remain simply the city hall) as long as there is no computer system. Once a computer system is added, the reality can become much more than it was physically intended for. The arrow and the percentage are just indications for the tester, but don’t really have any use. So it really depends on the application if there is any use for visual feedback. Also keep in mind that still a lot of experimenting is happening in this area, and that not all applications are necessarily useful at first sight. 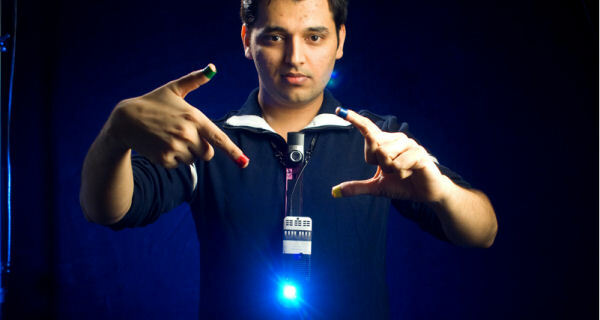 Another experiment is the 6th sense application in which a camera and a projector are carried around by the user (we might make a post for that one too, but you can find out already things here: http://www.pranavmistry.com/projects/sixthsense/). Some applications demand visual feedback, but very often that’s not even necessary: a simply beep will do the trick. One of the applications is taking a picture of the environment: you move your 2 hands in front of the camera, and form a frame (http://arie.bubberman.eu/wp-content/uploads/2009/12/Sixth_Sense2.jpg) after which a picture is taken. No visual feedback, but still, reality is augmented because your fingers become the triggers. That’s a definition for how we see it now. In the end, all computer systems augment our reality: they provide us with new information, making things possible that were never possible before. The line between all of those aspects is rather thin. The wikipedia definition is one that limits itself to visual feedback (as we know them from the smart phones) and does not define what input is used to do so. But it DOES define that an external input of information is needed to augment a live reality. While visual feedback is quite common, it’s not at all the only way for a system to give feedback, that’s why this simple definition does not cover it. If you prefer so, functionally augmentation can be called a tangible interface (while this is not true for taking pictures with your hand). So I’d consider ‘functionally augmentation’ to be quite a lot broader. Last but not least: this is still a highly experimental area that does not have any decent descriptions or definitions, so let’s not focus on that too much. I’m not entirely sure what that last one actually means. I found another project today that claims to be augmented reality! Check out the movie! This is something in between augmented reality (the environment of the car is augmented – streets, lights…), while it’s also augmented functionality (because it actually controls the game).